THE BUNNY FAMILY CAME HOME TO FIND A BUNDLE OUTSIDE THEIR DOOR. THEY GASPED. IT WAS A BABY WOLF! "ADORABLE!" SAID MAMA. "HE'S OURS!" SAID PAPA. It's love at first sight for Mama and Papa Bunny. They adopt little Wolfie without another thought, dressing him up in pink pajamas with bunny ears, totally smitten with their new baby. He is just so cute! Only daughter Dot sees her new adoptive brother for what he is! "HE'S GOING TO EAT US ALL UP!" SAID DOT. But despite Dot's repeated warnings, Mama and Papa seem blind to Wolfie's true nature. Dot is sure Wolfie is just shamming when he appears to prefer carrots, even though he obviously chomps rather than nibbles. But Mama and Papa cite his good behavior. He's a good eater and sleeper, Papa points out. Dot resents the newcomer, but her parents are too snookered with Wolfie to foresee what she sees coming. Dot's vegetarian friends are not fooled. ""HE'S GOING TO EAT US ALL UP!" THEY SCREAM. "NO KIDDING!" SAID DOT. "LET'S PLAY AT YOUR HOUSE." Wolfie grows bigger and so does his appetite. Dot is dispatched to the Carrot Patch to shop for groceries, and Wolfie, towering but still clad in a large pink coverall with rabbit ears, goes along to carry the shopping basket. Dot is picking through the produce when suddenly Wolfie looks intently in her direction, bares his fangs, and starts to growl. I knew this was going to happen someday, thinks Dot! Is nature about to trump nurture? 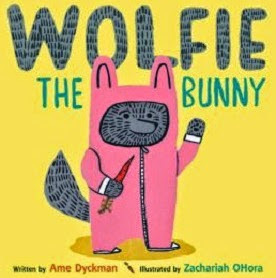 Not this time, in Amy Dyckman's delightful new bunny tale, Wolfie the Bunny (Little, Brown and Company, 2015), which cleverly stands the Ugly Duckling theme on its head. Dot is correct that Wolfie is no bunny rabbit, but Mama and Papa's nurture is vindicated when Wolfie and Dot join forces against a bear who has them both on his dinner menu. Youngsters waiting for Dot to be vindicated will be surprised but pleased when Dot and Wolfie team up to dispatch the bear and join hands, big sister and "little brother," as they head home for a big carrot dinner. Dyckman's narrative keeps the storytelling tight but punchy, wisely keeping Wolfie out of the dialogue and leaving it to her illustrator to fill in the comic details, and Zachariah OHoro's charming acrylic artwork is pitch-perfect, with simple but telling illustrations of hip, city-dwelling rabbits in a different setting from the usual woodsy big-bad-wolf tale. A pleasant twist on the theme of family love and loyalty, this one will have young readers howling for more Wolfie and Dot stories. "A treat of a picture book." says The Horn Book, joining most critical journals in their starred reviews. buy books online Discover the best Teen & Young Adult Literature & Fiction. Milet is known for its thoughtful, beautiful, quality books for its commitment to different voices and visions.